I need a diagram of how to hookup 4-6 volt deep cycle batteries for a 12 volt system? 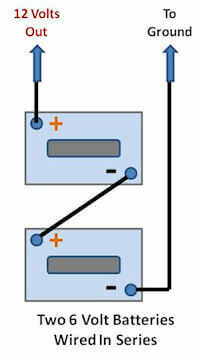 ANSWER: Hi Rob, I have included two diagrams. The first one is the one you requested on hooking up 4 six volt batteries to your RV's House Battery system. The second one is for those folks that want to hook up 2 six volt batteries to their RV House Battery system. You might also want to take a look at the video below to see how easy it is to setup the house batteries properly. For more information on why you should use 6 volt deep cycle batteries as house batteries in your RV, you should read my answer to: Should I Use Six Volt Deep Cycle Batteries as House Batteries in My RV?. I( want to add another set of 6 volt batteries to my truck camper. How important is it the wire length to be the same ? I have to add the batteries about 10' from the current set, is this going to ba problem? What is the recommendation for wire Guage to be ised to wire batteries together and also to wire to system? Note from RVing Al: You should read the article Should I Use Six Volt Deep Cycle Batteries as House Batteries in My RV? that I refer to in my answer above, it explains why you want to use 6 volt deep cycle batteries as your RV's house batteries. Hope this helps. Batteries in series adds voltage. Batteries in parallel just gives extra amps. Series is taking 2 batteries and tyin a pos and neg together. Hook your leads to the pos of one battery and the neg of other uses in series. To use 4 batteries just jumper over to the second set of batteries. Pos 2 pos, neg 2 neg just as shown in the 4 6 volt diagram. Why does the co propane detector sound off? I hooked up two more six volt batteries in my trailer, everything works fine except the co propane detector now sounds off, not as if there's a leak but as if there's an electrical problem, a beep every 30 seconds or so. I put another detector in and it does the same thing? Any ideas? your double six volt battery connection doesn't show where the power comes into the first battery. Where is the power in? What terminal? 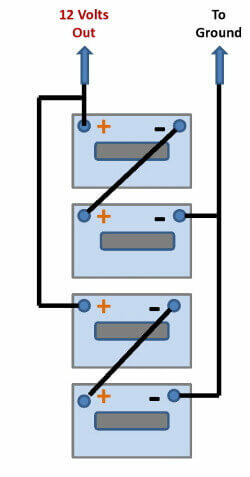 The diagram shows the batteries hooked 2 sets of 2 in series and both sets of 2 hooked in parallel. I need a diagram that shows wiring and configuration for 4 six volt house batteries in a 2005 Holiday Rambler Neptune. My batteries are in two rows, two in each row, side by side. I saw the diagram that was posted on hooking up 4 6 volt batteries to the RV. I was wondering if there is any advantage to hooking up my 4 6 volt batteries either in series or paraellel. On the diagram is that paraellel?? ?